Monkey hut tarp mod for less wind loading concept. Comments Off on Monkey hut tarp mod for less wind loading concept. I posted this idea here on the BM site. I am seriously thinking about building a monkey hut to add to my yurt. It seems to me that the parachute effect of the wind getting under the hut could easily be minimized by not using one solid tarp, but a minimum of 3 tarps overlapped like very long roof shingles. So if a 20 x 10 tarp is normally used, maybe three 4 x 20 tarps stretched out length wise across the monkey hut frame, and over lapped by a foot or so. I know there are no 4 x 20 tarps, but I use that dimension to help draw the concept. Imagine the wind blowing sideways across your camp…. 1st idea: If the roof tarp goes on first, and the side tarps last, with the side tarps overlapping the roof, then air flow can exit going up through the roof from inside the hut if the edges of the sides are just a little loose. This would not allow so much lifting force. Airflow could not happen in the opposite direction so it would reduce dust ingress. But it would allow some rain to come in. 2nd idea: If the side tarps go on first, over lapped by the roof tarp, then the airflow could only move from outside the hut to the inside. I’m not sure that’s desirable. But it would keep the rain out. Hmmm. 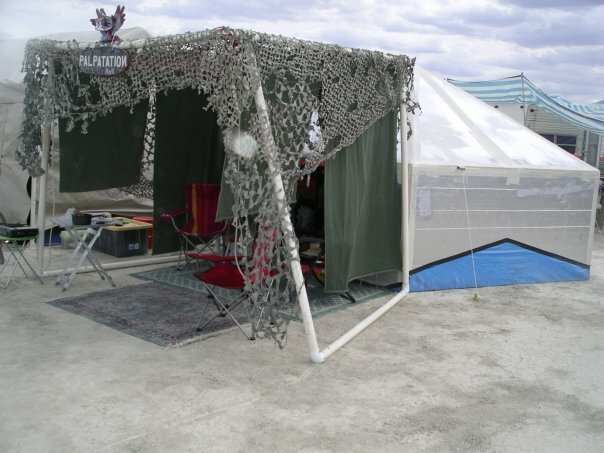 Maybe if the roof tarp was left looser with longer cords/bungees than the sides, or maybe only bungied to the end pvc loops, it would allow wind to escape by raising up some and letting the wind out. It would also keep the rain out. After thinking about it I like this idea best. When the wind blows into the hut, it will have a route to escape through the two overlapping seams in the roof. But when wind tries to blow down onto the roof, the wind is blocked. The overlap of the 3 tarps provides a sort of one way valve for the air flow. I thought of this because of street banners having so many crescent shaped cut outs made to allow the wind to blow through the banner, lowering the wind loading substantially. The problem with cutting crescents into a monkey hut tarp is that the wind and dust could blow into and out of the hut. Comments Off on Roof Rack Concept! 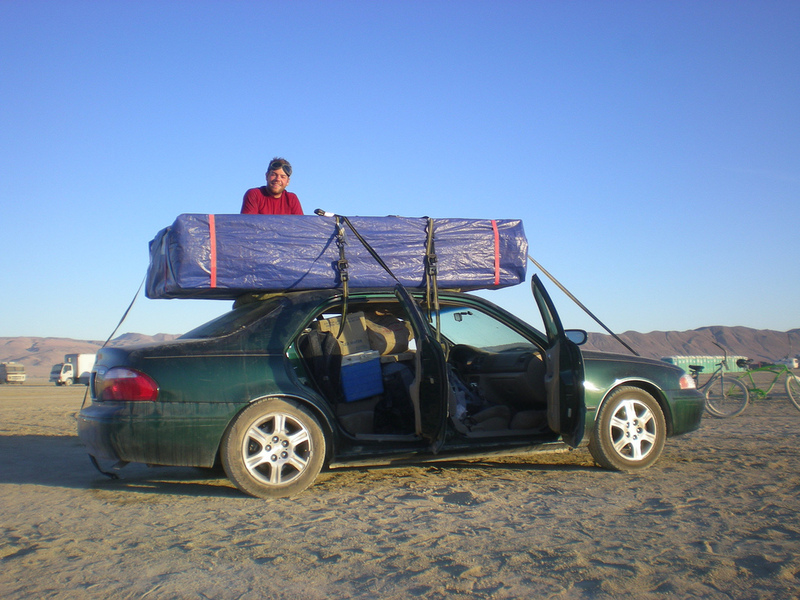 After being motivated by how Cowboy and Connie mounted their yurt and large shade structure to the roof of their 4 door sedan, it struck me that Bill had given me some large structural aluminum pieces way back when we were conceiving of our combat robot, Max Wedge. As it turns out I had a perfect assortment of these parts to make a very solid roof rack. Here is a bad cell phone pic of what I discovered today. A 2 x 4 will run lengthwise and attach to the 3 mounts on each side. Then by machining a 1 x 4 notch across the top of the 2 x 4’s I can put three 1 x 4’s across the roof to support the underside of the yurt. I need to shorten the last pair of mounts near the rear of the roof to the same height or slightly higher, than the other 4 mounts. It also occurred to me today that the roof rack needs to be really solid since our yurt stacks 2 feet high compared to the standard 1 foot high. The wind resistance will be about double. I have an idea on how to make the front end of the yurt more aerodynamic using just the front bumper straps, some rope and a piece of canvas. It will form a triangle in front of the yurt to help clean up the air flow a bit. The 4 inch tall space between the yurt and the roof will allow storage of a good size shade structure. While hunting around for shade ideas to make the yurt even more thermally efficient, I found this couple who added a great shade structure to their yurt. They took care of all of the issues I’m looking at with my yurt. Here is the thread where I found the initial information. Here is a pic of their shaded Yurt on the Playa. Here is the happy couple. Cowboy and Connie. Truly amazing to see yet a second yurt transported on top of a car roof. Gives me great hope that my Honda wagon will handle the load well. 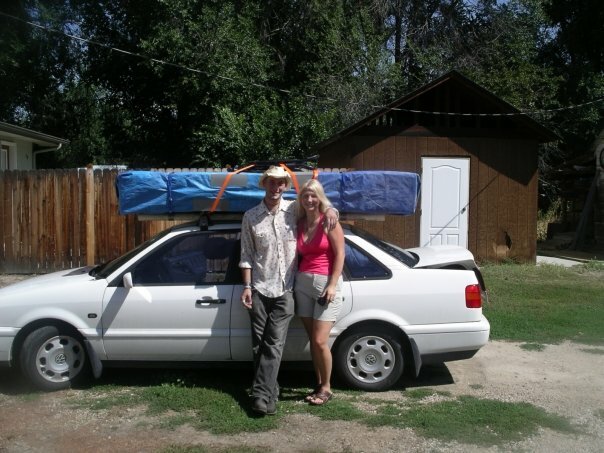 This couple used a roof rack. I don’t see any additional straps. I’ll have to find out if they used any straps to hold the yurt in place at freeway speed. 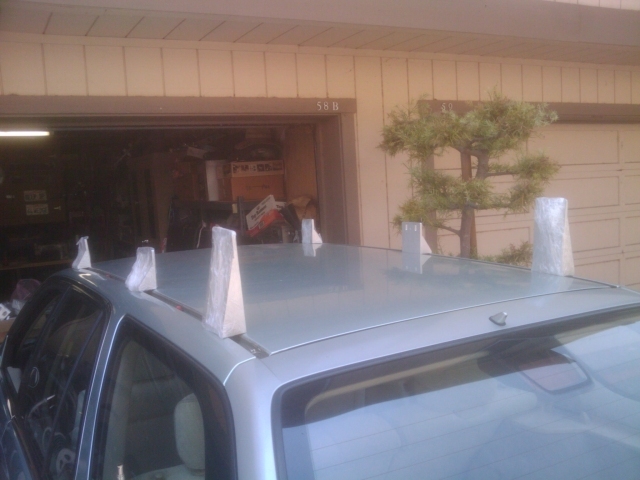 Here is Zanes car with his yurt transported on the roof as well. Zane reported that his yurt slid back about 5 inches during transport. Does not look like a roof rack was used.